Sussex's hopes of qualifying for the knockout stages of the Royal London One Day look slim after a six-wicket loss to Glamorgan at Sophia Gardens. A match-winning partnership of 98 from only 10 overs between Colin Ingram and Kiran Carlson saw Glamorgan win their first game in the cup, against as a strong Sussex team, who included Chris Jordan and Jofra Archer for the first time this season. This defeat and two abandoned games last week has probably denied the visitors any chance of qualifying for the latter stages of the competition. Ingram was undefeated on 95, as his team reached their target with 10 balls remaining. After Sussex had been put in, the two Lukes - Wright and Wells - gave their team a brisk start, sharing 41 in eight overs before Wells chipped Timm Van Der Gugten to mid-on; then Wright, who had scored 41 from 34 balls, flicked one down the legside from Lukas Carey to the wicketkeeper. Andrew Salter’s off spin was introduced in the 12th over, and with Graham Wagg bowling his cutters effectively from the other end, they restricted Sussex’s progress, with no boundaries conceded from 16 overs. The visitors also lost two wickets, with Ben Brown sent back attempting an impossible run, and Harry Finch LBW, sweeping at Salter. After Ingram and David Lloyd- the fifth and sixth bowler - came into the attack, Michael Burgess and David Wiese restored Sussex’s fortunes, by adding 71 in the next 10 overs. A series of full tosses and short pitched deliveries did not help Glamorgan’s cause, and they would have been disappointed not to have capitalised after bowling so well in the middle of the innings. The partnership was broken by the admirable Wagg, who began his second spell by having Burgess caught low down at extra cover, before Wiese, in the next over, struck a short ball from van der Gugten to cover point. 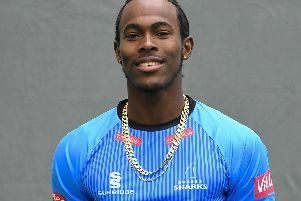 His belligerent innings of 67, included seven fours and two sixes as Sussex reached a commendable total from their 50 overs. Despite losing Nick Selman early on, Aneurin Donald, who has experienced a lean start to the season, and Connor Brown moved along at a brisk pace and had put on 69 for the second wicket, until Donald, who made 40, chipped Chris Jordan to Burgess on the mid-wicket boundary. Brown quickly followed, dragging one from Ishant Sharma to mid-on, but David Lloyd gave Ingram valuable support by adding 77 for the fourth wicket, with Ingram the dominant partner. Lloyd departed for 20, but Kiran Carlson, playing his first game in the competition, soon made his intentions clear by striking Danny Briggs and Archer for sixes. With five overs remaining, Glamorgan required 47, but the home team kept up with the required run rate with another brace of sixes from Carlson, as he reached a rapid unbeaten 59 from only 40 balls. Glamorgan captain Colin Ingram said: “The boys are thrilled to have won, and we deserved it. We fielded well. The bowling was also good, and we conducted the chase perfectly. It was good to have Kiran back, and he was quite outstanding today.